Saut d'Eau (Sodo) water fall is one of the most famous waterfalls in Haiti and a great Caribbean tourist destination you should consider visiting at least once in your lifetime, on your next trip to Haiti or you next Caribbean adventure. Saut d'Eau in English means waterfall and, in Haiti coincidentally, there is actually a famous waterfall named Saut d'Eau. Come to Haiti, rent a car, go visit Saut d'Eau. Seau d'Eau is only about 1h 30 minutes from Port-au-Prince. Just head to the Department du Centre via Route Nationale #3, when you reach the city of Mirebalais, you are almost there. Saut-d'Eau is a commune in the Mirebalais Arrondissement in Centre Haiti. 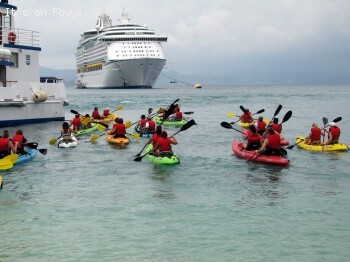 See the tourists from the Royal Caribbean Voyager Of The Seas cruise ship hanging out and enjoying their Kayak Adventure in Labadee Haiti. If you want to Cruise to Labadee, Haiti, and discover your very own private paradise set amid spectacular mountains and lush foliage, you will have to book a cruise with Royal Caribbean Cruise Line. Labadee is a private resort leased to Royal Caribbean Cruises Ltd., for the exclusive use of passengers of its three cruise lines. 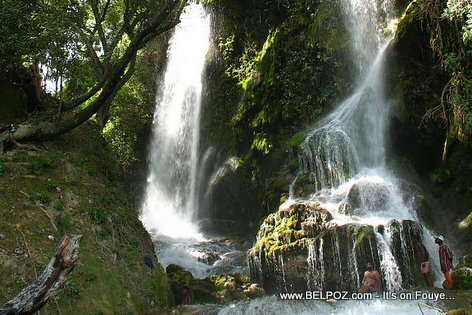 Here is a photo of the Bassin Bleu Waterfall Haiti, a very famous waterfalls in Haiti and a great place to visit on your next trip to Haiti and the Caribbean. Bassin Bleu, Blue basin in English, is not just a waterfall. Bassin Bleu is a natural water site located west of the city of Jacmel, in the Sud-Est department of Haiti. This amazing site that you must visit consists of three natural water pools along the Jacmel River (Petite Rivière de Jacmel). Basin Bleu is one of them. 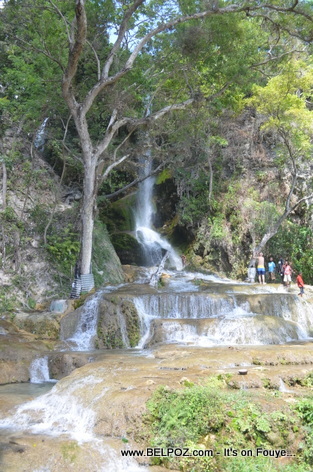 Saut-d'Eau is a gorgeous and sacred waterfall in the Centre department of Haiti. Saut-d'Eau is a great tourist attractions and definitely one of the great destinations to visit when in Haiti. The town where the waterfall is located is also called Saut-d'Eau, named after the waterfall. Saut d'Eau is hot spot in Haiti, a very cultural and very religious hot spot where Haitians, both Catholic and Vodou practitioners go on pilgrimages each year. It is believed that the Virgin Mary of Mount Carmel appeared on a palm tree there in the 19th century. Haitians go there and they bathe in the waterfall. Some believe it has healing powers. So, definitely add Saut-d'Eau to your Haitian places to visit bucket list. Here is a great Haiti tourist attraction you just have to visit on your next trip. 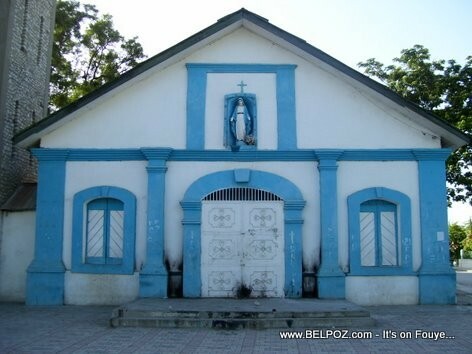 This old catholic church in Hinche Haiti is more than 500 years old. This is one of the oldest catholic churches in Haiti, the oldest cathedral in the island of Hispaniola. Here is a great place to visit on your next trip to Haiti... 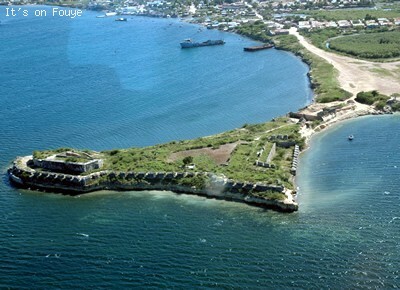 This is Fort-Dauphin in the city of Fort-Liberte, Nord-Est Haiti. This is an aerial view of Fort-Dauphin... Isn't she Beautiful? This fort was built in 1732. As you can see, Haiti is not just what you hear on the news, this Caribbean nation has lots of beautiful places to visit with so many tourist attractions, some of these attractions are still unexplored. we call them Haiti's hidden treasures. Add this page to your favorites because we will be updating it it very often. What was Tonton Bicha thinking about?